Speeding up QE’s slow-as-a-trickle pace means, in no uncertain terms, the Fed selling the QE-bought stocks it owns on the open market. If (and it’s a big ‘if’) the Fed suddenly switches sides and goes from perpetual stock market buyer to consistent stock market seller, that is a seismic bearish shift. 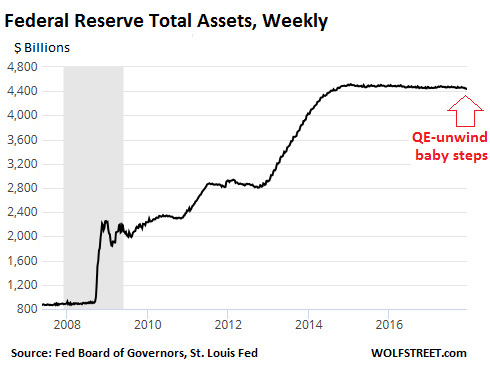 Any significant acceleration is impossible to achieve by just allowing maturing securities to “roll off” without replacement: In most months, there are only about $30 billion to $35 billion of Treasuries on the Fed’s balance sheet that mature. For example, in March, $31.2 billion mature; in April, $30.5 billion. MBS come on top of that. To increase significantly the pace, it would have to be done by outright selling securities into the market, which would further change the dynamics of the market, just when the US Treasury will be issuing a record amount of new debt to finance the growing deficits. In order to find buyers for all those Treasuries that would flood the market, the yields would have to rise to be very appealing, so that investors would buy Treasuries rather than other securities. When yields rise, by definition bond prices fall. This would ricochet throughout the market with a substantive repricing of all assets. And it would come at the same time that the ECB will have stopped its QE purchases and that the Bank of Japan is starting to think out loud about an “exit,” as they call it. And this would make for an interesting confluence of factors.